Volleyball is the original multi-tasking sport. It teaches boys how to work as a team, strategize against opponents and be a good sportsman. It also requires considerable skill to pass, volley, block, spike and serve. Our players achieve success. 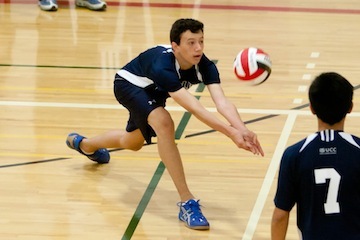 Boys in the varsity volleyball program have gone on to play intercollegiate volleyball in the National Collegiate Athletic Association in the United States and at Canadian universities, and some have played for the Canadian national junior team. One former UCC student even played professional volleyball in Lithuania. Inter-school volleyball competition starts in Grade 7 at the Prep with an Under 14 team, Boys can try out for the Grade 8 Under 14, Under 16 and varsity volleyball teams at the Upper School. Players further develop their skills and coaches help them cultivate a passion for the game. Boys who flourish love a fast game where they can interact with teammates and work hard to advance basic skills. Teams at all levels have performed well in the Conference of Independent Schools Athletic Association and the Under 16 and varsity teams have qualified for the Ontario Federation of School Athletic Associations competition several times.